One of the things I’ve always loved about Star Trek is the idea of exploring the unknown. Isn’t that what we do in our daily lives? Explore unknown situations, emotions, ideas? Humanity is in a constant state of exploration, it’s probably one of the best things about us – that yearning for more knowledge as a species. This quest is one that also links Star Trek naturally to freshman-level college writing courses. The idea in beginning academic writing courses I have taught at state universities in America is to learn through the writing process and to be able to formulate an educated argument from what has been gleaned. Also, I’m a huge Trek fan. Well before I was born, my parents arranged the weekly grocery shop around the airing of Star Trek. When I was a child, I would watch the original series, laid out on the shag carpet and floor pillows with my dad. When Star Trek: The Next Generation appeared, my first childhood crush was Jonathan Frakes. My sister, a cool teenager nine years older than me and about to head off to college, took me to see Star Trek IV: The Voyage Home at our town’s only movie theater at the time. The culture of Trek is strong in my family. So, I suppose it’s genetics that I want to spread the ideals of Star Trek while also working through the realities of contemporary issues. The first time I used Star Trek while teaching a class was during a five-week summer course. The course was a small basic intro research and composition class that met every day in a computer lab. 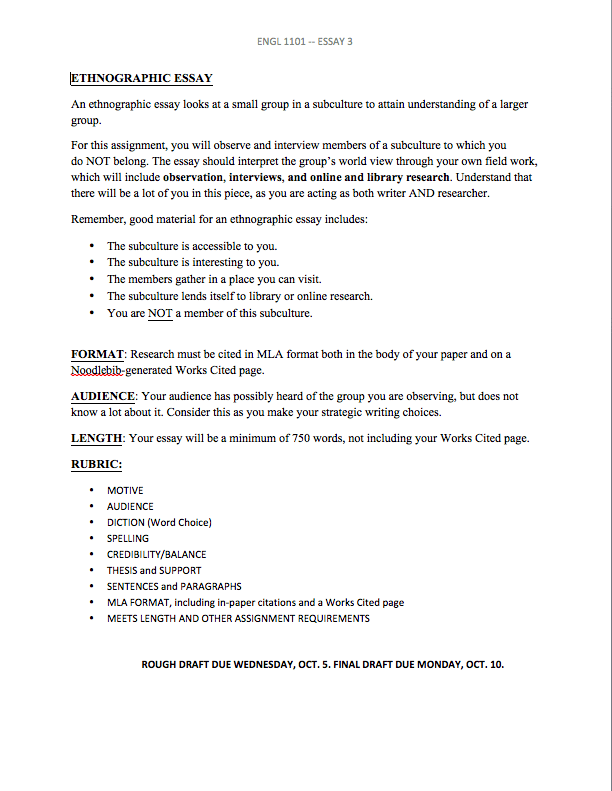 One of the assignments was for students to utilize the writing process and create an ethnographic essay. An ethnography is the non-biased study of a subculture that is not the author’s own. It looks at a small subset in order to understand the larger whole through such tools as observation, interviews, and research (both in the field and at the library/online). It differs from the negative idea of stereotyping because it is about how the people involved identify themselves, not how they are identified by those outside the subculture. First, though, we watched Trekkies, the documentary about the Trek fandom by Denise Crosby. I chose to utilize Star Trek on this assignment in particular because everyone knows what a Trekkie/Trekker is. Western culture has accepted what the word means and has certain ideas about it, whether they be rooted in fact, fiction, or a mixture of both. We all know enough about the world of Trek to recognize the fandom (subculture) when we see it. I wanted the students to understand the process as if they were a documentary filmmaker, as well as see the visuals of what a subculture contains. For instance, a subculture examined through ethnography must have a place of meeting (Star Trek conventions), artifacts (props from the shows, collectibles, etc. ), its own language and way of speaking (the jargon used, such as “Make it So!” or “LLAP” or even the Klingon language itself), ritual (Spock’s Vulcan salute, the wedding of Keiko and Miles O’Brien). Members of the subculture must be recognizable to each other and have basic connections that bind them as a group. For the purposes of this assignment, though, I asked the students to utilize their non-biased observation skills to make a list of five subcultures on campus of which they are not a part. They went to the bookstore, the campus coffeeshop, the cafeteria, the commons, the library. Some checked out the bulletin boards to find club meeting notices, others looked up their social media mutuals. Some had new roommates who were of different subcultures. Many had great success this way. Others stumbled to get out of their comfort zones, which is to be expected. They needed a boost of confidence, and I was happy to play cheerleader. The students did well in the class when they could get past their own foibles, such as approaching strangers or being the oddball. I had one student athlete who was very much involved in the athletic program and academics who wanted to understand about his roommate’s interest in games such as D&D and Magick: The Gathering. At first, he was confounded by the idea someone would be interested in these fantasy games – but by the end of the course, he was going to meetings on his own to learn more. He became part of the subculture that had once so befuddled him. There was also a student who was an atheist who chose to do his assignment on one of the fundamentalist Christian religions prominent in Appalachia. In addition to absorbing media and doing their own observations, we were able to discuss further about how characters on the show were doing their own sort of ethnographies. A show about exploring the unknown and understanding other cultures puts into practice exactly what we were studying – in the medium of television. By delivering ethnography to them in a manner to which they were already accustomed, it helped the students make connections as to the processes being used to explore without prejudice and write without judgment. These are the types of assignments I loved giving as a teacher and, then, debriefing students about during class. They were excited about genuine new knowledge that would help them better understand some piece of the world around them. This is what gave me hope that maybe Roddenberry’s idea humanity can be better is an actual possibility – the human mind isn’t closed off, it just needs a better way of understanding and questioning. I wanted to include more of the philosophy of the cultural phenomenon of Star Trek in my classes as a way to bridge a gap for my college freshmen, who are oftentimes confronting the idea of questioning the status quo for the very first time. Star Trek offered them that bridge to understanding, and maybe someday they will ask the questions that will make their world – our world – better. Of course, I also became the so-called Star Trek Professor on campus, and that was fine by me. I would be so psyched if I had a teacher that worked Star Trek into the curriculum… wtf, you’re awesome, lol.